Tyrone Taylor does not have any MLB stats for the season. Draft: 2012, Milwaukee Brewers, 2nd rd. Graduated from Torrance (CA) High School, where he also played football (running back/safety) ... Rushed for 1,521 yards and 20 touchdowns along with 11 receiving touchdowns as a senior ... Committed to California State University - Fullerton prior to signing with Milwaukee ... Enjoys spending time with his friends, family and dog, a German pinscher named Nova ... Follow him on Twitter (@tyrone_taylor15). Batted .278 with 20 HR, 80 RBI and 13 stolen bases in 119 games at Triple-A Colorado Springs ... His 80 RBI led the Brewers organization and 20 HR tied for second ... Was named Brewers Minor League Player of the Month for June (27g, .263, 5hr, 15rbi) and August/September (29g, .333, 7hr, 26rbi) ... Was added to the 40-man roster on 10/29. Missed most of the season with a strained right hamstring, an injury suffered in Spring Training ... Played just 32 games between Rookie Arizona (7g, rehab assignment) and Double-A Biloxi (25g). Entered 2016 as the seventh-best prospect in the organization according to Baseball America ... Batted .232 with 9 HR and 34 RBI in 134 games at Double-A Biloxi. Entered 2015 as the top prospect in the organization according to Baseball America ... Batted .260 with 3 HR, 43 RBI and 10 stolen bases in 128 games at Double-A Biloxi. Entered 2014 as the second-best prospect in the organization according to Baseball America ... Batted .278 with 6 HR, 68 RBI and 22 stolen bases in 130 games at Class-A Brevard County ... Led the Florida State League in doubles (36) and ranked second in hits (141) ... Became the first player in Brevard County Manatees history to hit for the cycle when he accomplished the feat in a 20-0 win on 4/29 at Clearwater (5-for-5, 5r, 3 RBI, 1bb) ... Was named Brewers Co-Minor League Player of the Month for July (26g, .340, 1hr, 13rbi, 8sb) ... Finished the season at Double-A Huntsville, where he appeared in 5 games ... Following the season played for the Glendale Desert Dogs in the Arizona Fall League and batted .271 with 7 RBI in 21 games. Batted .274 with 8 HR, 57 RBI and 19 stolen bases in 122 games at Class-A Wisconsin ... Was named Midwest League Player of the Week for 6/3-6/9 after he batted .522 (12-for-23) with 1 HR and 3 RBI in 6 games ... Was named Brewers Minor League Player of the Month for June (25g, .438, 3hr, 13rbi). Had his season cut short due to a right shoulder injury. 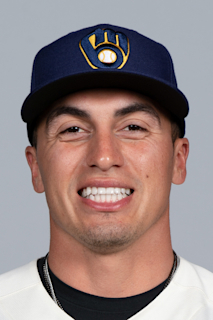 March 13, 2019 Milwaukee Brewers optioned CF Tyrone Taylor to San Antonio Missions. October 29, 2018 Milwaukee Brewers selected the contract of CF Tyrone Taylor from San Antonio Missions. April 30, 2018 Tyrone Taylor roster status changed by Colorado Springs Sky Sox. April 23, 2018 Colorado Springs Sky Sox placed LF Tyrone Taylor on the 7-day disabled list retroactive to April 22, 2018. April 1, 2018 LF Tyrone Taylor assigned to Colorado Springs Sky Sox from Biloxi Shuckers. February 23, 2018 OF Tyrone Taylor assigned to Milwaukee Brewers. August 16, 2017 Biloxi Shuckers activated LF Tyrone Taylor from the 7-day disabled list. July 27, 2017 Biloxi Shuckers placed OF Tyrone Taylor on the 7-day disabled list retroactive to July 22, 2017. July 9, 2017 Biloxi Shuckers activated OF Tyrone Taylor from the 7-day disabled list. July 5, 2017 Biloxi Shuckers sent OF Tyrone Taylor on a rehab assignment to AZL Brewers. June 24, 2017 sent OF Tyrone Taylor on a rehab assignment to AZL Brewers. June 12, 2017 OF Tyrone Taylor assigned to Biloxi Shuckers. March 3, 2016 OF Tyrone Taylor assigned to Milwaukee Brewers. March 27, 2015 OF Tyrone Taylor assigned to Milwaukee Brewers. August 28, 2014 Tyrone Taylor assigned to Huntsville Stars from Brevard County Manatees. March 30, 2014 CF Tyrone Taylor assigned to Brevard County Manatees from Wisconsin Timber Rattlers. March 1, 2014 OF Tyrone Taylor assigned to Milwaukee Brewers. August 8, 2013 Wisconsin Timber Rattlers activated OF Tyrone Taylor from the 7-day disabled list. August 2, 2013 Wisconsin Timber Rattlers placed CF Tyrone Taylor on the 7-day disabled list retroactive to July 31, 2013. March 30, 2013 CF Tyrone Taylor assigned to Wisconsin Timber Rattlers from Helena Brewers. March 23, 2013 OF Tyrone Taylor assigned to Milwaukee Brewers. July 8, 2012 Tyrone Taylor assigned to Helena Brewers from AZL Brewers. June 16, 2012 Tyrone Taylor assigned to AZL Brewers from Milwaukee Brewers. June 15, 2012 Milwaukee Brewers signed OF Tyrone Taylor.